I tend to go overboard when bananas are on sale and I buy more than we could ever need. After a few days of banana almond toast, a handful of banana topped oatmeal bowls, and some banana bread variations, I’m all banana-ed out. I’ll slice up a few bananas and throw them in the freezer for later smoothie use. But then what? What’s a girl to do leftover ripe bananas? 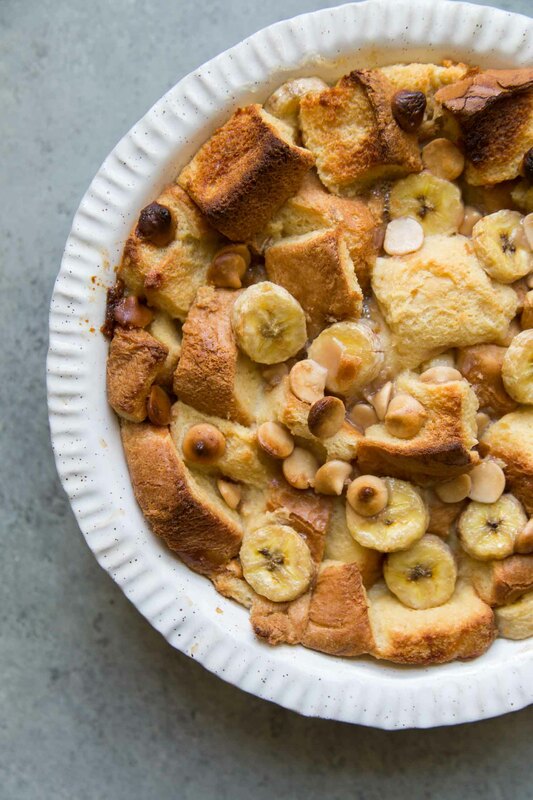 Banana rum bread pudding! 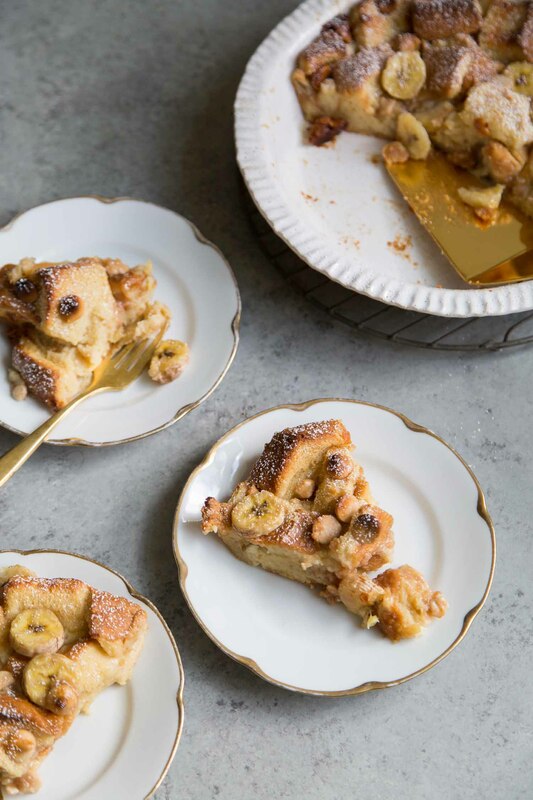 This banana rum bread pudding is a quick and easy dessert that takes less than 15 minutes of prep. It’s the kind of dessert recipe that comes in handy when you have unexpected visitors that come to your house anticipating a bite of something sweet. Bread pudding is often served in large casserole pans or or individual ramekin custard cups. I find that bread pudding looks a lot classier and elegant in a pie tin. 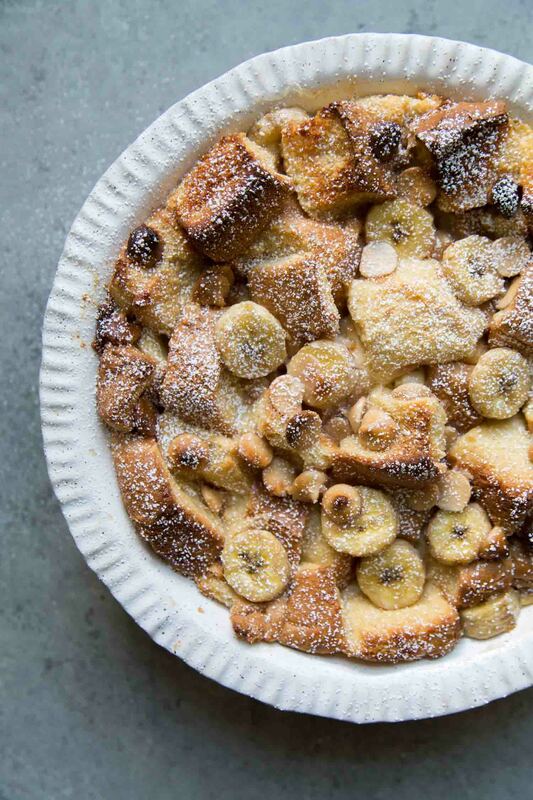 Any and all breads can be used for bread pudding: baguettes, brioche, croissants, even doughnuts! Usually day-old bread (lightly stale) is preferred because it is better suited to soaking up the liquids. While most bread pudding recipes completely soak the breads in the liquids, I prefer to keep some parts of the bread exposed during baking. This allows for the top layer of the bread to get toasty in the oven. I enjoy the contrast of the crunchy top layer and the soft and custard center. It’s best to use ripe bananas (the spotty kind that you would use for banana bread) for this recipe. While I used caramel baking chips, chocolate chips would also be a fantastic substitute. Feel free to added chopped nuts, as well. 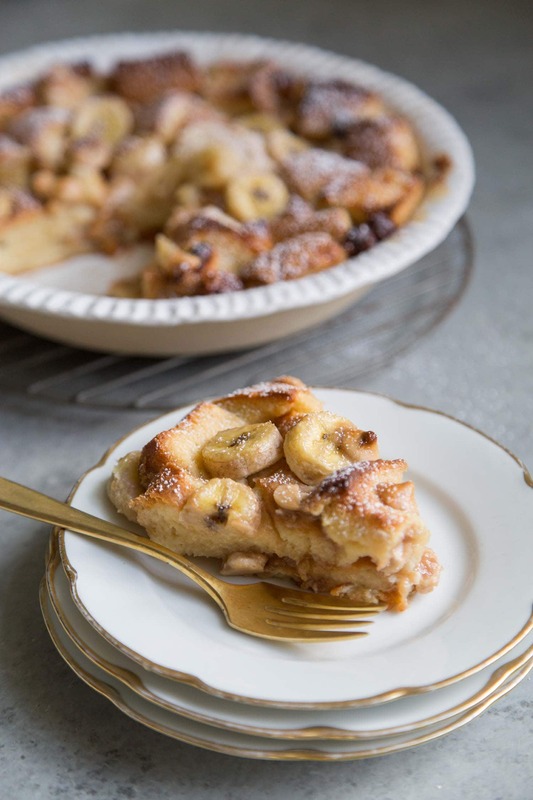 For extra decadence, this banana rum bread pudding could be served with a scoop of ice cream, a dollop of whipped cream, or drizzled with caramel! Preheat oven to 350 degrees F. Lightly butter 9-inch pie plate and set aside. 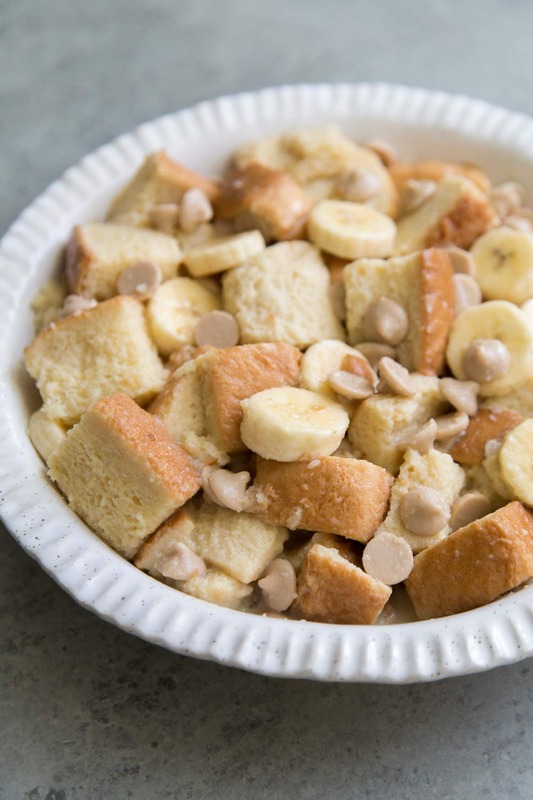 In a large bowl, add cubed bread, caramel chips, and sliced banana. 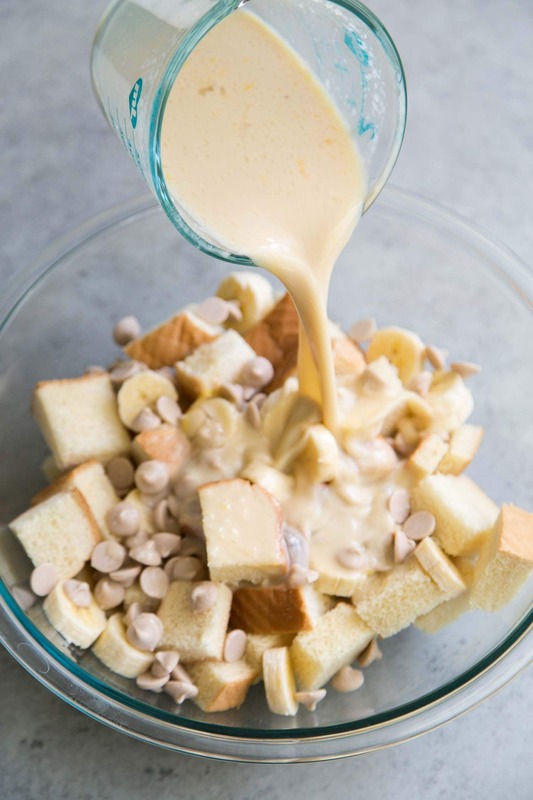 In a large measuring cup, whisk together milk and eggs until smooth. Add vanilla, rum, sugar, brown sugar, and salt. Stir until sugar has dissolved. Pour liquid mixture over cubed bread. Toss to combine. Transfer mixture (including all liquid) into prepared pie plate. Allow bread to soak for 10 minutes. Bake for 40-50 minutes until bread pudding has slightly puffed up, the liquid is set, and the top exposed bread pieces are toasted. Let bread pudding sit for 10 minutes to slightly cool. Serve bread pudding warm and dust with powdered sugar, if desired. Day old (almost stale) breads work best at soaking the liquids.